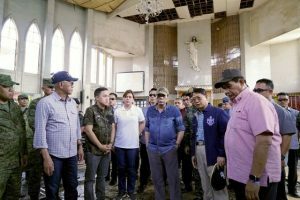 Twenty people were killed and 81 injured when two bombs exploded at a Roman Catholic cathedral on Sunday 27 January on the southern Philippine island of Jolo. 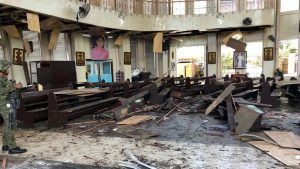 The first bomb exploded inside the Cathedral of Our Lady of Mount Carmel at around 9 am at a mass attended by approximately one hundred people. The door, pews and windows of the cathedral were blown off. The second bomb exploded shortly afterwards in a town square outside the cathedral. Bishop Angelito Rendon Lampon, who served as a priest at the cathedral for almost two decades, said many of his former parishioners were shaken following the attack. “I know many of the victims because I worked there for 21 years. I am praying for the victims and their families. We are condemning this attack. Those who are responsible have no respect even for the sanctity of the place.” He added that the priest officiating at the time of the bombing, Fr Ricky Bacolcol, “was still in shock and could not speak about what happened”. Five soldiers and fifteen civilians died in the attack, which was widely condemned in the Philippines by both Christian and Muslim leaders. Dr Fahra Tan Omar, chief of the Jolo Public Hospital, identified some of the fatalities as Romulo Reyes (58) and wife Daisy (53), Dolores Sarmiento Tan (72), Fe Non (84), Cecilia Sanches (42), Juliet Jaime (50), Cecilia dela Cruz (61), Reynaldo Pescadera Sr. (74), Alba Perpetua (40), Bibing Perpetua (40) and Ridzmar Mukadik (19). It is believed that six children were wounded in the cathedral attack. On the day after the attack, President Rodrigo Duterte visited the scene, where he spoke with survivors and also relatives of those who died. He was reported to be angry about the attack, blaming a security failing in the region, which has been under martial law. An investigation is underway to discover who was responsible for the attack, which was claimed by at least two Islamic militant groups in the area. While the Philippines is predominantly Christian, Jolo island is part of the southern part of the Mindanao island group, which has a significant Muslim population and is home to a number of violent extremist groups that have fought for the island’s independence for over forty years, hoping to create an independent Islamic state. The attack came a week after voters in the region approved a new autonomous Islamic region in the southern Philippines which it is hoped will end nearly five decades of a separatist rebellion that has killed over 12,000 people and displaced two million. Although most areas approved the autonomy deal, it was rejected in Sulu province, where Jolo is located. The province is home to a rival rebel faction that is opposed to the deal as well as smaller militant cells that are not part of any peace process. Christians in Mindanao face significant persecution and Christian converts from Islam face particular pressure from their families and communities.